A 20-year-old male with acute lymphoblastic leukemia presented with fever, nausea and abdominal pain. A review of systems revealed recent weight loss with a further 8-kg weight loss during the current admission. 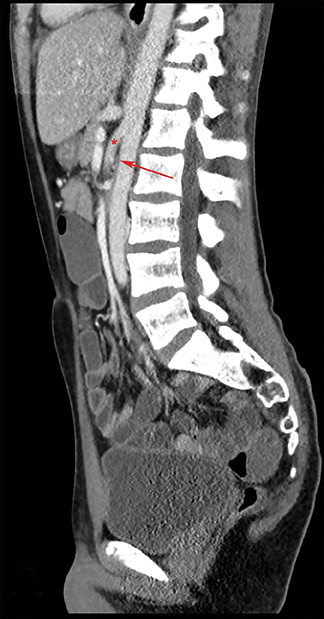 Initial CT of the chest, abdomen, and pelvis with intravenous contrast demonstrated fluid-filled loops of small bowel suggestive of gastroenteritis. Additional findings included dilation of the first and second portions of the duodenum with narrowing and small caliber of the third portion as it crosses the midline posterior to the superior mesenteric artery (SMA, Figure 1) and decreased aortomesenteric angle (Figure 2). 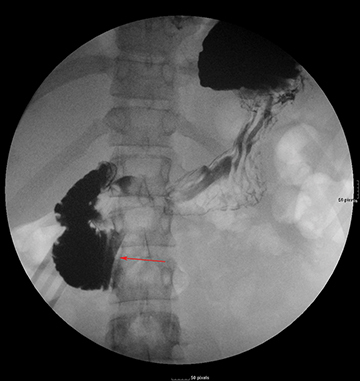 A barium upper gastrointestinal study was ordered to confirm superior mesenteric artery compression syndrome as suggested by the CT findings. If confirmed, this would account for the patient’s nausea and abdominal pain. 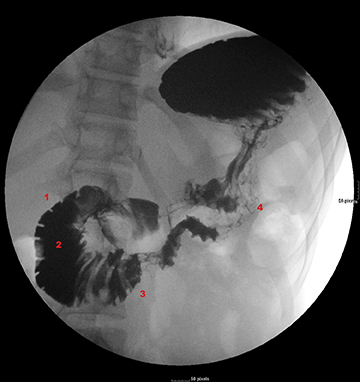 The upper GI study revealed a dilated first and second portion of the duodenum with abrupt linear vertically oriented cutoff of contrast at the junction of the second and third portions of the duodenum (Figure 3). Upon repositioning, there was subsequent contrast transit to the small-caliber third and fourth portions of the duodenum (Figure 4). Findings were diagnostic of SMA compression syndrome. Superior mesenteric artery compression syndrome. The differential diagnosis includes duodenal stricture, intestinal scleroderma, annular pancreas, and median arcuate ligament syndrome. Treatment is usually conservative and includes nutritional support with proper positioning during feeding.3 Nasogastric feeding is often inadequate as food pools in the stomach and duodenum, proximal to the level of obstruction. Alternatively, total parenteral nutrition is often utilized; however, it is not ideal due to its relatively high expense, need for inpatient stay and potential complications. Nasojejunal (NJ) feeding, which bypasses the narrowed distal duodenum by positioning a feeding tube tip distal to the region of small bowel compression, is the preferred approach in many institutions to provide nutritional support. An interventional radiologist places the NJ feeding tube under fluoroscopic guidance. The ultimate goal is weight gain and restoration of the retroperitoneal fat. This in turn increases the aortomesenteric angle and relieves the extrinsic compression of the superior mesenteric artery on the underlying duodenum. Normal peristalsis returns, food is propelled distally, and normal GI function is restored. Superior mesenteric artery compression syndrome should be considered in a patient with rapid weight loss who presents with nausea, vomiting, and abdominal pain. It is an important entity to recognize because it can be readily treated with nutritional support. Failure to recognize the disease can lead to a perpetual cycle of weight loss and vomiting leading to further clinical deterioration. Lamba R, Tanner D, Sekhon S, McGahan J, Corwin M, and Lall C. Multidetector CT of vascular compression syndromes in the abdomen and pelvis. RadioGraphics. 2014;34:1,93-115. Neri S, Signorelli SS, Mondati E, et al. Ultrasound imaging in diagnosis of superior mesenteric artery syndrome. J Intern Med. 2005;257(4):346-351. Agrawal, GA, Johnson PT, Fishman EK. 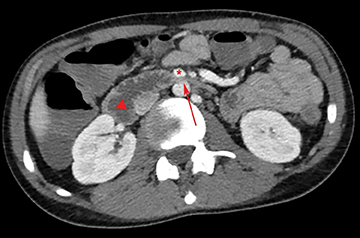 Multidetector row CT of superior mesenteric artery syndrome. J Clin Gastroenterol. 2007;41:62-65. Kothari TH, Machnicki S, Kurtz L. Superior mesentery artery syndrome. Canadian Journal of Gastroenterology. 2011 25(11):599-600. Pediatric Radiological Case: Superior mesenteric artery compression syndrome. Appl Radiol.